This vase is 7.5 inches high and 1.5 inches in diameter. It was thrown from "Santa Barbara" clay. This is a "once fire" pot. Instead of the usual cycle of form/bisque_fire/decorate/final_fire, the green-ware (unfired pot) was placed inside another, already fired, pot and then covered with sawdust. The pot into which this one was placed is called a "saggar" pot. It has a lid. The sager pot was placed in the kiln and was heated to 1300° Celius (2380° Fahrenheit), cone 10. The ashes from the sawdust left the bottom part dark. The sawdust was dirty so some of the dirt melted and clung to the pot. The top part of the pot was fully fired. 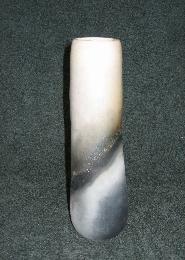 The bottom part did not reach cone 10 temperatures because the ashes insulated it. So the vase would not hold water. (It would eventually seep through the bottom.) To fix this defect I poured hot wax into it.